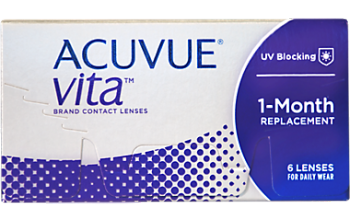 New ACUVUE® VITA™ Brand Contact Lenses with HydraMax™ Technology, a non-coated silicone hydrogel formulation balanced to help maximize and maintain hydration in this lens. Designed for reliable, superior comfort all month long. 6 contact lenses in buffered saline containing methyl ether cellulose.